Following the state legislature’s landmark approval extending California’s cap-and-trade program through 2030 by a supermajority vote, Berkeley Law’s Center for Law, Energy & The Environment (CLEE) and our research partners have completed the first comprehensive, academic study of the economic effects of existing climate and clean energy policies in Southern California’s Inland Empire. 41,000 net direct jobs, some of which are permanent and ongoing and many of which resulted from one-time construction investments. Join the report authors as we discuss our findings on a webinar next Tuesday. 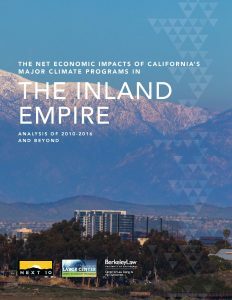 We’ll cover the impact of cap and trade, the renewables portfolio standard, distributed solar policies and energy efficiency programs and their effects on the Inland Empire’s economy to date and going forward, as well as what these findings mean for other regions of the state and beyond. The webinar will run from 10 to 11am on Tuesday, September 12th. Register now to join the discussion!